Apple Inc. has just unveiled its tablet-style iPad. The large, high-resolution screen makes iPad perfect for watching any kind of videos. With Aura DVD Ripper, users can convert DVD and a wide range of videos for watching on their iPad. Aura DVD Ripper supports Apple's iPod, iPod nano, iPod touch, iPod classic, iPhone, iPhone 3G, iPhone 3GS, Apple TV, and the latest iPad. Many other media players and mobile phones are also supported. Besides iPad videos, Aura DVD Ripper can also convert videos to AVI, MP4, FLV, WMV, MPEG and dozens of other video formats. Find out all features and supported formats of Aura DVD Ripper, the versatile iPad DVD video converter. 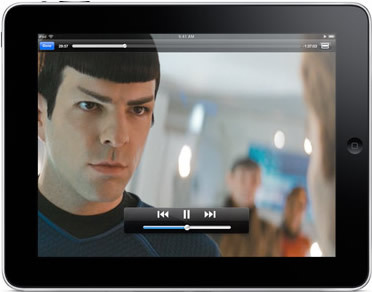 The iPad video converter enables users to download online videos from Youtube, MetaCafe, NicoVideo and others. It can then convert the downloaded videos to supported videos for iPad and any other media players and platforms. Aura DVD Ripper, the versatile iPad video converter, is the wonderful DVD software that allows you try before you buy. You can click the following link to download the iPad video converter program and try it out. The iPad Video Converter is compatible with Windows XP, Vista and Windows 7. Please note that it’s not compatible with Mac OS X. If you feel like the iPad video converter program after trial, you can buy a copy of Aura4You license to use the full version. See the complete list of features of the iPad video converter. Have questions about the iPad video converter? Please feel free to contact us. Like iPods and the iPhone, the iPad can sync with Apple's Macintosh and Microsoft's Windows computers. Jobs said the iPad will also be better for playing games and watching video than either a laptop or a smart phone. Software coming with the iPad includes a calendar, maps, a video player and iPod software for playing music. All seem to have been slightly redesigned to take advantage of the iPad's bigger screen. But there is no Apple Video Converter from Apple Inc. The large, high-resolution screen makes iPad perfect for watching any kind of video: from HD movies and TV shows to podcasts and music videos. Switch between widescreen and full screen with a double-tap. Because iPad is essentially one big screen, with no distracting keypad or buttons, you feel completely immersed in whatever you’re watching. With iPad, there is no up or down. It’s designed to show off your content in portrait or landscape orientation with every turn. And because it uses a display technology called IPS (in-plane switching), it has a wide, 178° viewing angle. So you can hold it almost any way you want and still get a brilliant picture, with excellent color and contrast. The iPad comes with these applications: Safari, Mail, Photos, Video, Youtube, iPod, iTunes, App Store, Maps, Notes, Calendar, Contacts, and Spotlight. It also comes with the iBooks application, which displays books and other ePub-format content downloaded from the iBookstore. Ripping DVD movies to iPad videos is one of the most important functions of Aura DVD Ripper, the versatile iPad video converter. After downloading and installing the iPad video converter, run the program, insert your DVD to the drive, click the Open DVD button to load the DVD movie to iPad DVD ripper program. Select titles or chapters that you want to rip for your iPad, choose a output format that is supported by iPad, and then hit the Convert button. After conversion, just open the output folder to look for the converted videos and transfer them to your iPad for watching later. No matter it’s AVI, MPEG, WMV, MOV, or not often seen video format like DVR-MS, the iPad video converter can handle it well and convert it to any supported format. You can convert MPEG videos to iPad videos, convert WMV videos to iPad videos, and even download and convert Youtube videos for iPad, and more. Click the Add Video button, or just drag and drop selected videos to the iPad video converter program, select output profile, and then hit the Convert button. Converted videos are stored in the output folder as specified by you, or by default. Get the converted videos and transfer them to iPad and enjoy them on the go. Just remember that Aura DVD Ripper can do a lot of things besides converting videos for iPad. "Yes, the iPad is small, lightweight and slim. But can you swim with it?" "Will women send their husbands to the Apple store to buy iPads?" And a "MadTV" comedy sketch from several years ago about an electronic sanitary napkin called the iPad went viral on Youtube. However, after Apple unveiled the iPad at an invitation-only event, some tech journalists said they thought the jokes about feminine hygiene would dissipate soon. "If you think of iPods in 2001, we probably got the same smirks," one journalists said. "I think the jokes will disappear." Still, the torrent of jokes about the iPad could stick in consumers' minds. The iPad is a tablet computer developed by Apple Inc. It features multi-touch interaction with print, video, photo, and audio multimedia, internet browsing, and runs most iPhone OS apps. The iPad is to be available for sale at the end of March (Wi-Fi version, worldwide) and end of April (Wi-Fi + 3G version, in the United States and some other countries) 2010. 3G will be provided in the U.S. by AT&T and sold with two prepaid contract-free data plan options: $14.99/month for 250 MB and $29.99/month for unlimited. The plans will be activated on the iPad itself and can be canceled at any time. iPad. Our most advanced technology in a magical and revolutionary product at an unbelievable price. Watch the keynote. Watch the video. The iPad. With a revolutionary, 9.7 inch touch screen, and amazing new apps, it does things no tablet PC, netbook, or e-reader could. Starts at $499. Apple' s much-rumored iPad could trounce the Kindle DX. Amazon won't mind, but the magazine industry will. 28 Jul 2009 ... Jobs may be ready to step away from Apple, but not before completing a tablet as his magnum opus.